The good news is: there are solutions, based on unbiased research and proven in practice (click here for a great place to get up to speed: https://therealtruthaboutweightloss.com/?ref=elspethfeldman). And there is a reason for it! Today Chef AJ is on a mission so that no one will ever have to suffer what she went through. You can join her and watch 32 full length expert interviews starting March 16th. You will hear from Dr. Dean Ornish, Dr. Caldwell Esselstyn, Dr. John McDougall, Dr. Michael Greger, Dr. Neal Barnard, Dr. Joel Fuhrman, Brenda Davis, Rich Roll, Dr. Doug Lisle, Dr. Alan Goldhamer... and many more. With over 30 of the world’s most respected experts participating, you’ll get answers to all the tough questions. Cravings, binge eating, carbs, fats, food addiction, exercise, intermittent fasting, hormones, menopause, supplements, surgery, inflammation, visceral fat, epigenetics… no stone is left unturned and you’ll walk away with a step by step plan on how to achieve the health, the body and the vitality you desire and deserve. And even if obesity doesn’t affect you and your loved ones, this event deserves everyone’s support because only by stopping the obesity epidemic can we give our kids a chance to live happy and long lives..
Help us spread the truth. The second annual UWL Live conference is being held in Vegas over Labor Day Weekend 2018! In this life-changing event, Chef AJ and John Pierre reveal the secrets of Ultimate Weight Loss. Alas if you are not able to be there in person you can still watch it live or on replay. Join in from the comfort of your home for only $97 for the two-day event if you register by Wednesday August 8th. On August 9th the price goes up to $197. The replay will expire in March 22, 2019. Good news!!! One of my lucky readers will be selected to win a FREE Live Stream of the two-day event to watch in the comfort of your home at anytime. (Details below). How to set yourself up for success, even if you've got a busy life! The incredible lineup of speakers is not to be missed!! Tickets are still available to attend the live event September 1 -2, 2018! UWL LIVE VEGAS. Chef AJ is offering to the Live Stream to one lucky winner – here is how you can enter to win. It's fast and fun. You must do all three things to be eligible to win. Get your entry in by noon on Wednesday, August 8th and I will pick a winner and announce the winner on my Facebook page. I will also email the winner directly. Get your entry in right away! Join me and my daughter Caileigh for a fun demo at Whole Foods Market in Annapolis , Maryland on November 1st at 6:30 PM. We will be demonstrating recipies from my new eBook Pardon My Turkey. Learn how to prepare a delicious vegan Thanksgiving feast for your family and friends. The menu will include Whole Stuffed Pumpkin, Butternut Beet Bites, Gingersnap Pumpkin Trifle and so much more. Preparing an all vegan, mostly raw high tea for my daughter's bridal shower was just the excuse I needed to fill the house with flowers and colorful delicious food. Tea time was a very important time of day as a child growing up in Zimbabwe. Not because I loved tea but because there were usually treats to go along with the tea. I have been taking my daughter to tea at a Reynolds Tavern in Annapolis since she was a little girl and I have hosted several tea parties at my home. This was the first vegan tea party I have hosted. Invitations went out encouraging the guests to wear hats- which just added a touch of fun. My nieces got busy coming up with fun games to play and my daughters future mother-in-law got very creative with beautiful party favors. I was able to focus on the food, beverages and flowers. Scones with Jam and "Cream"
I had made black bean brownies two weeks in advance and frozen them. Early in the week I made the fruit tarts with a cashew cream that I put in the freezer. too I made the chocolate avocado mousse tart two days in advance and stored that in the refrigerator. The day before the tea I made all the truffles and then everything else I made on the morning of the party with the help of my sons girlfriend. It was a was a lovely afternoon and I am happy to say that there was very food little left over so it must have been enjoyed by all. The best part was that my house was clean and full of flowers. I will link the recipes as soon as I have each of them up so please check back. In the meantime put on the kettle and "pinkies up!". Party favors. Caileigh and Brian "A Special Blend"
I made this cake for my daughter and her fiancé to celebrate one year of being together. It is so quick and easy (with the right equipment....vitamix) . I learnt how to make a variation of this from the wonderful creative Chef AJ. 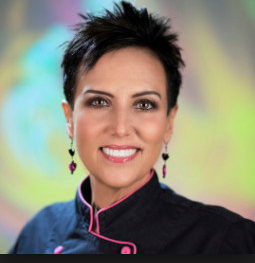 Be sure to check out all of her cooking webinars for nutrient dense calorie light recipes. The only ingredients are fruit so there is no guilt in having a second slice. You will need to freeze the fruit overnight so plan ahead just a bit. Decide on your layers, try pick contrasting colors for more of a rainbow effect. For this cake I made the first layer peach, the middle was strawberry and the top layer was blueberry. I could have flipped the cake upside down once it was frozen but I had some green grapes that I wanted to use for decoration and they contrasted nicely with the purple blubbery ice-cream. Blend frozen bananas and frozen peaches in a high speed blender until it becomes like soft serve ice-cream. Using a spatular spread it in the bottom of a spring form pan. Be sure to wipe the sides of the pan so it is clean for the next layer. Pop the pan in the freezer and clean out the blender for the next layer. Repeat more bananas and strawberries and then again with bananas and blueberries. Smooth off the top layer and freeze the cake for several hours. Take it out the freezer for about half an hour before you are ready to eat it and carefully pop open the springform pan. You can either leave it on the base or you can transfer it to a cake stand. Decorate the top with fresh fruit of your choice and then cut it in slices with a sharp chefs knife. This is a lovely light and eye pleasing dessert that always wows guests. Who knew it would be so easy! Please join my daughter, Caileigh and me for a Raw Food "cooking" Demonstration at Whole Foods in Annapolis on Wednesday June 7th. Come and learn about the benefits of a raw food diet. Watch us demonstrate how to prepare vibrant healthy living foods full of flavor and color. Learn how to use a dehydrator and how to make delicious sauces in the blender. On the menu will be Raw Pizza, Collard Wraps, Zoodles Alfredo, Cashew Cheese, Fruit Tart and Truffles and more. My daughter Caileigh and I had a wonderful time teaching a nutrition and cooking workshop at her old high school, The Key School, as part of their annual Wellness Day Event. It felt great to be back on campus and to be surrounded by the upbeat energy of the students. We started by leading students through a mindful eating exercise and then we taught them the basics of knife skills and got chopping. With Cinco de Mayo coming up this week we decided to show them how to easily put together a plant-based feast to share with their friends and families. The students were so attentive and eager to learn and they were amazed at how easy it is to pull together nutritious and delicious food. We talked about the different ingredients and encouraged them to create recipes of their own with flavors they liked rather that stick to an exact recipe. Once we had prepared all the dishes everyone enjoyed making themselves a colorful and delicious plate of nachos – corn tortilla chips topped with Black Beans, Mango Salsa, guacamole and Cashew Cheese. We also had the students cut up cucumbers and multi-colored carrots (purple carrots were a favorite) to dip into the delicious Hummus they had made. The two ingredient Chocolate Ice-cream was a big hit for a guilt free dessert. Learning how to cook just a few simple healthy dishes is so important and empowering for everyone. Food is a wonderful way to be creative and bring people together. Next Up - Caileigh and I will be presenting a Gourmet Raw Foods Workshop at Whole Foods in Annapolis on Wednesday June 7th at 6:30 pm. Join us to learn about the benefits of a raw food diet. Watch us demonstrate how to prepare vibrant healthy living foods full of flavor and color. Learn how to use a dehydrator and how to make delicious sauces in the blender. On the menu will be Raw Pizza, Collard Wraps, Zoodles Alfredo, Cashew Cheese, Fruit Tart, Truffles and more. We look forward to seeing you there. Cost: $15. Click here to register online. This dedicated vegan has a new mantra: Never make a salad. If it seems counterintuitive hang with me a bit longer. Don’t make a single salad – make several at the same time! This handy tip will keep you on track and you’ll always have healthy delicious food ready to eat. Fast. That’s why we call it The Speedy Vegan! By making several at one time you get all the chopping out of the way and have salads ready to go whenever you desire them. There are so many benefits to eating a high raw diet so I encourage everyone to eat "embarrassingly large" salads at every meal. In sharp contrast, most restaurant salads fall short on size, freshness and flavor. So time to get chopping. Salads can be as plain or as elaborate as you like. There are no rules....except "Never Make Just One." 1. Gather your containers. I use a couple of large glass storage containers and what ever salad bowls I am going to use for our next meal. 2. Start with greens. I like to use the pre-washed baby spinach and spring-mix lettuce or I use romaine for a crunchy alternative. I full each container half way. If I am not going to eat the salad in the next two days I reverse to order and add the greens last. 3. Next chop up veggies - onion, shredded carrot, cucumber, radishes, purple cabbage or whatever combination you like. To save time you could buy pre cut veggies. I sometimes buy shredded carrots or spiralized zucchini. Add the veggies to the salad, customizing each container for different family members if need be. 4. Next I wash and cut up fruit -blueberries, pomegranates, apples, oranges, clementines, mango, pomegranates, grapes, pineapples or what ever is in season. The combinations are endless. 5. Top your salads off with sprouts and fresh herbs. Sometimes I top the salads that we are eating right away with a few pumpkin or sunflower seeds. 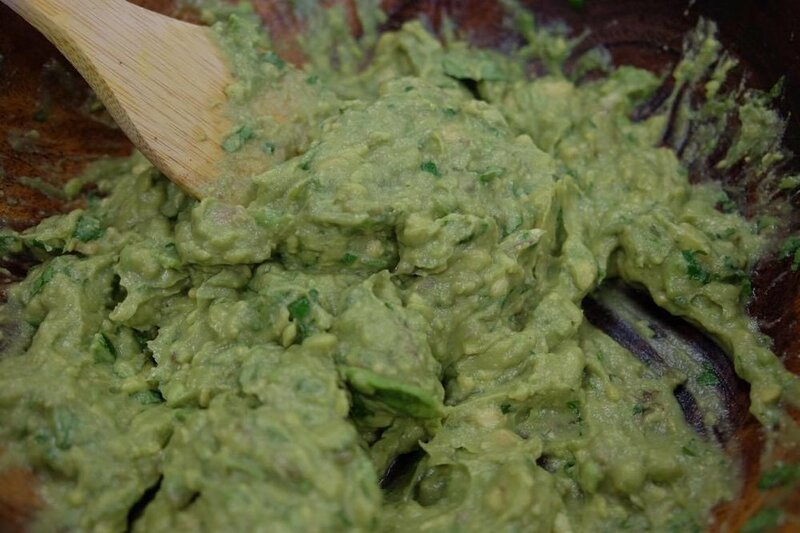 Nuts and avocado are also a delicious healthy fat topping. That’s it. Just pop them in the refrigerator and pull them out whenever you like. Because of all the fruit in the salads we don't need calorie-rich, nutrient-poor salad dressings. However, we do love a good balsamic vinegar. Here’s our family favorite: Napa Valley Naturals Grand Reserve. Make a meal of your salad by adding a scoop of beans, brown rice, quinoa or baked potato. Want to really go to town? Add sautéed mushrooms and a couple of potato waffles to your dinner salad and you’ll be satisfied. Guaranteed. Great taste, texture and so full of nutrients. Halloween and Thanksgiving have come and gone and the Christmas tree is now up but I am still in a Pumpkin state of mind. On a recent cold Saturday morning I was craving something warm, sweet and creamy so I came up with this nourishing treat. I had a couple of small pumpkins sitting on my kitchen counter so I cut them open and scooped out the seeds (yes I rinsed them and spread them on a silpat mat and baked them until crunchy in a 300F oven). I then put the pumpkins in a large pot of water and boiled them until soft. I then scooped out a couple of cups of flesh and put that in my vitamix blender along with a very ripe banana, almond milk and pumpkin spice. I blended this all together on the warm soup setting fro several minutes. I made two large servings which I poured into mugs and topped with a sprinkle of pumpkin spice. It was delicious just like that but if you prefer sweeter drinks you could also blend in a medjool date. Blend all the ingredients in a high speed blender on the warm soup setting for several minutes or blend and then heat in a pot on the stove. Pour into mugs and sprinkle with a little pumpkin spice or cinnamon. Shepherd's Pie has always been one of my favorite meals on a cold winters day. It is warm, nourishing and comforting. But sometimes it can feel a little heavy so I came up with this version that really is "creamy and dreamy" and packed full of nutrients. For the filling I start by sautéing carrots, celery and onion in a pot with a little vegetable stock and then I add in cooked lentils, mushrooms, fresh or dried thyme, poultry spice, salt substitute and pepper. Once it is all warmed up I add in a few great big handfuls of baby spinach and let that wilt as I stir it into the filling. For the Creamy Dreamy Cauliflower Mashed Potatoes I like to use organic yukon gold potatoes un-pealed. I just scrub them well, cut them in quarters and put them in a pot of cold water with two or three whole cloves of garlic and boil them until the potatoes are soft. While the potatoes are boiling I steam the cauliflower and onion until it is quite soft. I also put the cashews in my blender and add boiling water to soften them. I then add the nutritional yeast, braggs aminos, lemon juice and salt substitute. When the cauliflower is softened I add it to the blender and blend it all together. This turns into a creamy delicious sauce that I love to have over steamed vegetables. Once the potatoes are cooked I drain them and mash them with the garlic and then I add the creamed cauliflower sauce and mash it all together. This is my absolute favorite version of mashed potatoes. I then divide up the lentil filing into whatever size dished I am using to serve. Sometimes I make a large pie using a rectangular glass pyrex dish so you can see both layers but more often I make individual ones and just heat up however many I need and save the rest for the following day. My husband loves finding this in his lunch box and always sends a text thanking me on Shepherds Pie days. Like a lot of dishes this one always taste better the next day. Top the filling with the Creamy Dreamy Cauliflower Mashed Potatoes and then warm in the oven until it is piping hot. I always serve this with peas and mango chutney on the side, I am not sure why but that is the way we always ate it when I was a child. This is a perfect dish to make ahead of time and it lasts for 3 to 4 days in the refrigerator. This is a crowd pleaser for vegans and non-vegans. Enjoy! Scrub the potatoes and cut in quarters and add to a large pot along with the garlic. Cover the potatoes with water and bring to a boil. 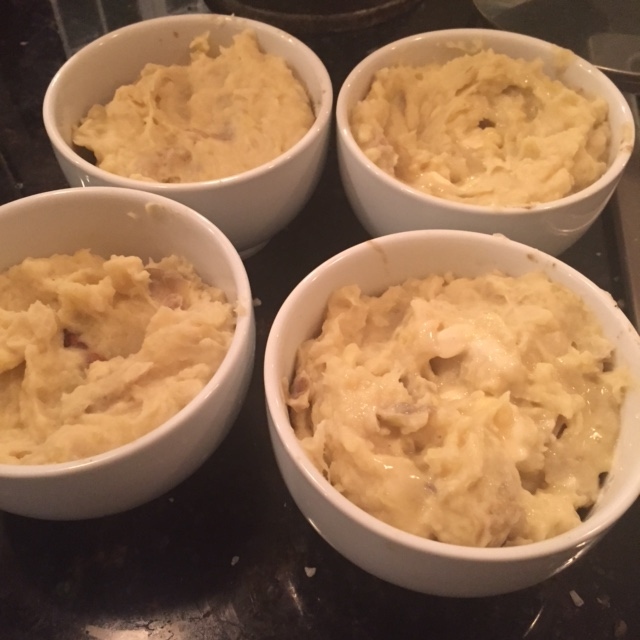 When they are tender (approximately 20 minutes) drain and mash with a potato masher. While the potatoes are cooking, sauté the onion, carrots and celery in a little vegetable stock until caramelized. Add the chopped mushrooms and lentils along with the herbs and seasoning and cook for 10 minutes more. Remove from the heat and add in the spinach or Swiss chard and let it wilt into the mixture. While the potatoes are boiling and the filling is cooking you can cook the cauliflower and onions either by steaming or just boiling until fork tender. While the cauliflower is cooking put the cashews in a high-speed blender and add half a cup of boiling water. When the cauliflower has softened add it to the blender along with the rest of the ingredients. Blend it all together into a delicious creamy sauce. Once the potatoes are mashed add a generous cup and a half of the cauliflower cheese sauce to the potatoes and mash it all together. Season to taste. Bake for about 20-30 minutes until heated through and slightly browned on top. This can be made in advance and stored in the refrigerator and heated right before serving. Its beginning to feel a lot like Thanksgiving. And do I have a treat for you! One of our lucky readers will be selected to win a FREE Holiday Extravaganza Feast Webinar hosted by Chef AJ this Tuesday evening, November 15th at 8PM EST. Will it be you? Here's the scoop. All the recipes are whole food plant based. gluten free, free of all sugar, oil and salt and delicious! They will not be published so the only way to get them is to sign up for the webinar or enter the drawing for a free entry right here. If you can’t watch the webinar live you will still be able to watch the replay and get the recipes by email. It's fast and fun. Here is how you can enter to win. You must do all three things to be eligible to win. Get your entry in by 2PM on Tuesday November 15th and I will pick a winner and announce the winner on my Facebook page. I will also email the winner directly. Get your entry in right away! After three overnight flights and an early morning cab ride we arrived in the beautiful city of Cusco, the one time capital of the Inca Empire. Walking the streets one can see the indigenous Quechua culture represented alongside Spanish colonial buildings erected on Inca walls all with a bustling tourist life flourishing in the midst. We headed directly to Green Point Restaurant an all vegan restaurant with a menu aimed to please any palate Given our jet lag and confused stomachs we were not sure what to order but settled on gluten free waffles, creole soup, bruscetta and tea. We sat upstairs in the bright green and sunny rooftop dining area and enjoyed overhearing the conversations of excited backpackers at nearby tables while we waited for our food. 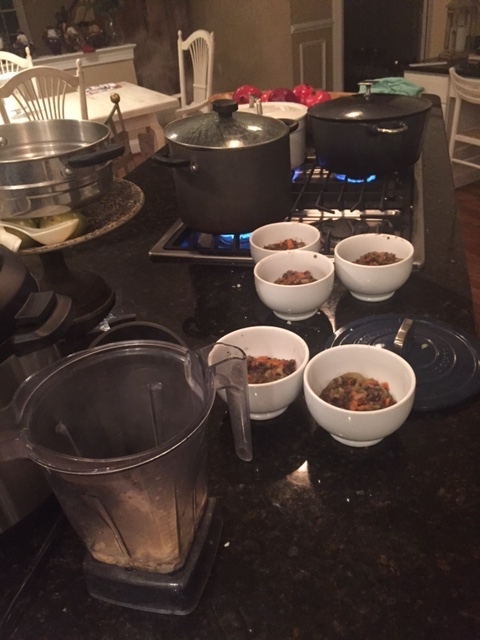 After a few cups of Muna (Peruvian mint) tea we started to revive and it helped that the creole soup and bruscetta were so flavorful and nourishing. At Green Point they showcase just how exciting, delicious and healthy vegan food can be while bringing more peace and compassion to the world we live in. After a wonderful welcome from Green Point we knew that this trip to Peru was going to be extraordinary. Next we headed to the markets and where awed by the abundance of beautiful fresh produce, flowers, breads and grains. It was here that I first learned that there are more that 2800 varieties of potatoes known to have originated in Peru. The Quechua people place such a high value on their cultural traditions and biological diversity and as a result all these varieties still exist. Farmers living in high altitudes where potatoes are cultivated trade them for crops grown in lower altitudes such as quinoa and corn. We wandered through the rows of vendors making fresh juices and calling out for our business and then moved on to the see the rows of vendors making fresh soup in small little kitchen stands. We saw endless selections of beans and grains and so many vegetables I did not recognize at all. After a couple of hours in the city it was time to head to the beautiful Sacred Valley and join our yoga retreat at Sacha Munay. We were treated with spectacular scenery all through the valley which was emphasized by dramatic changing weather patterns. The mountains surrounding the Sacred Valley are rugged, dry and rocky and the valley is emerald green, lush and full of springtime growth........the contrast is magical. We were welcomed at Sacha Munay with a delicious lunch of fresh picked salad, vegetables, warm soup and chunks of sweet watermelon, mango and papaya. Our bodies had adjusted from our travels and were now ready for a week of yoga and exploration workshops led by the impressive Explorations of Self team (Alana Roach, Caileigh Feldman and Brian Anahatta Russo). Meals at Sacha Munay were delicious and fresh and all made from local produce or picked from the beautiful vegetable garden on site. Our week at the retreat was life changing.........the daily yoga sessions were wonderful but just being in the Sacred Valley connected us closer to the earth and filled us with gratitude . We had so many valuable experiences but two that really taught us so much about the culture and the importance of food and food production. 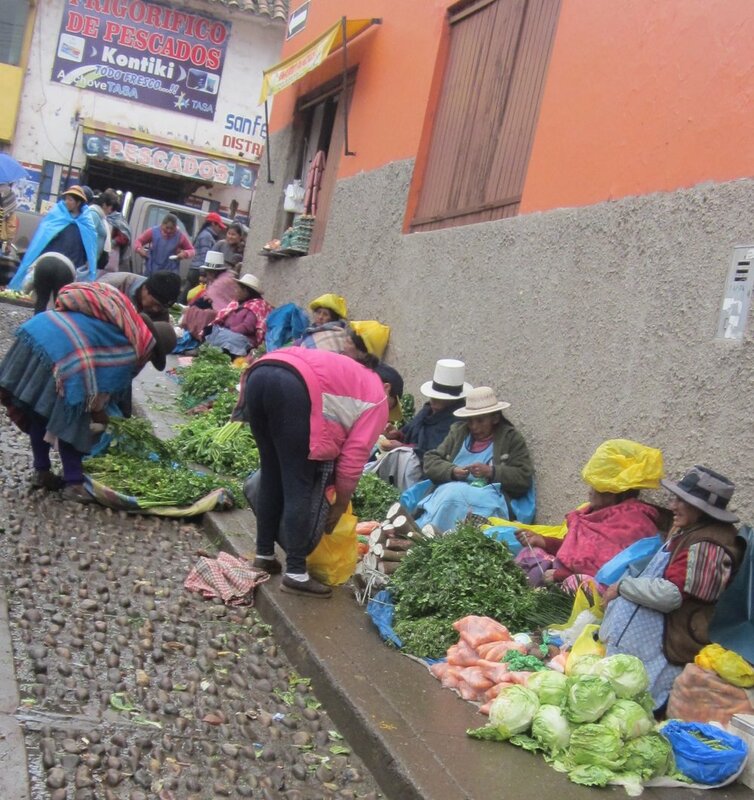 One was on a day trip high (14,800 ft) in the mountains above Pisac near lake Kimsaqucha where we were welcomed by a local villager into her kitchen for hot muna tea and a variety of potatoes that she had baked over coals. The potatoes are covered with chunks of dirt and clay to bake, this method of baking is called "watya". The potatoes were delicious and all so different from any we had ever eaten. In the countryside there are different types of potatoes for every sickness (they contain high levels of antioxidants). Our hosts adorable daughter kept us entertained by showing us how she cared for her precious teddy bear. It was so special to be in this warm and happy kitchen eating such fresh and local potatoes while the rain fell hard outside. The other experience we treasured was a a service day we did at a local elementary school. We were greeted in the school yard by excited, curious children eager to get to know us. Our assigned project was to help work in the school garden so after having a bit of fun in the five year olds Physical education class we went and met with the agronomist. Before getting to work we had an excellent hands on presentation on the gardening method the locals use to produce high yield organic produce. It turns out that sunshine and rain are important but the most important part is getting the soil right. The agronomist demonstrated how important it is to break up the hard packed soil and dig deep to loosen it up so that the roots can grow down low rather than spread wide and steal nutrients from plants close by. We were instructed to start on a bed just wide enough that we could reach the middle without ever stepping on the soil and compacting it. The ground was hard. rocky and compacted so it took a bit of muscle to get just a couple of rows ready for adding compost, biochar and a custom mix of minerals. After each application we had to mix it all in with the soil so that it was well distributed. With our soil all prepped and ready it was time to plant vegetables. We all got down and dirty and planted a variety of vegetables just as a soft rain started to fall which made the agronomist very happy. The whole time we were working in the garden the parents of the children were all busy preparing lunch for the children. Mothers and grandmothers were busy washing greens, chopping potatoes and getting Guinea Pigs ready for roasting over an open fire (yes GUINEA PIGS!!!). After our work in the garden we were offered a bowl of corn and potato soup which was hearty and good. Our week in the Sacred Valley came to an end but now we were ready for our trip to Machu Picchu. We spent a day touring the Inca ruins at Ollantaytambo and admired the terraces along the Inca trail green with corn, potatoes and quinoa.....my kind of food. The night before our day at Machu Picchu we stocked up on bananas, apples and nuts so we could board the bus at the crack of dawn. We were greeted with a glorious sunny morning and after a beautiful ceremony led by our guide we entered Machu Picchu and soaked in the energy of that wondrous ancient place. My husband and I had purchased tickets to climb Machu Picchu mountain so we left the group for a couple of hours to scamper up to the top of the mountain for views from 10,000ft. The hike up was steep but well worth it.....the views of endless mountains and beautiful cloudscapes. We hiked back down and toured the ruins before hiking all the way back down and into town for a well earned lunch in Aguas Calientes. My activity traker stated I had walked 23,727 steps and climbed 280 floors that day so needless to say I needed no help devouring an enormous green salad and a vegan pizza. Our last day was spent back in Cusco soaking in all that we had experienced and all the lessons. After wondering through the markets and being tempted by the wonderful looking soups being made on the spot we decided not to risk getting travelers stomach given that we had three fights in the morning to reach home. Instead we headed to the second Green Point Patio location and shared their outstanding bruscetta, risotto and a warm salad. On our last evening we enjoyed pots of hot Muna tea at Cafe Loco with views out over the city. Our hearts were full of gratitude for a wonderful trip. I am not sure what I was expecting from Peru but I was certainly overwhelmed by the rugged beauty of the land and the warmth and kindness of her people. Thank you. For more on Explorations of Self and their upcoming Yoga Retreats worldwide visit www.ExplortationsOfSelf.com Next retreat is in Costa Rica January 2017. I just got back from a quick visit to London and want to give a shout out to Mildred's Restaurant . I met up with some very special family members for a late mid week lunch at their Soho location (45 Lexington Street). This was my first trip to London since I became vegan so I had never eaten at Mildred's before and was utterly delighted to find this wonderful restaurant. We were seated at a table in one of their upstairs dining rooms and were served by a wonderful patient waiter. My beyond adorable and curious eighteen month old grand-niece insisted on exploring all the dining rooms and making new friends with the staff and customers. I loved this light filled private dining room and chuckled at the vegan take on the deer head wall mount. I ordered the Detox Salad to start and our table ordered a number of vegetarian appetizers. My main course was the delicious Sri Lankan Sweet Potato and Green Bean Curry with roasted lime cashews, pea basmati rice and coconut tomato sambal. My fellow diners loved the Polish Beetroot Burgers and fries. Desert was oh so decadent but knowing we would walk several more miles that day justified our order. I had the raw chocolate truffle cake with almond and date crust and fresh strawberries and I also had a taste of the salted caramel macadamia nut truffles. Being a chocolate lover I was in heaven but it was very rich so I was happy to share. I highly recommend Mildred's to anyone in London and look forward to going back and working my way through the menu. Vegan restaurant options are endless in the Golden State and I took advantage of quite a few on a recent two week trip out there. It's hard to know where to begin so I will tell you about some of my favorites. 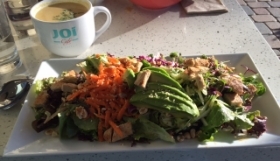 My husband and I just loved JOi Cafe an organic, plant-based, gluten-free cafe in Westlake Village, everything on the menu appealed to us so we ended up eating there three times! It was not just the food that got our attention it was also the breezy friendly atmosphere and warm inviting staff. On one of our visits I was lucky to meet one of the owners, the lovely and energetic Joi Stearns. Joi's personal story is so inspirational and her passion for her business is evident. We loved all four salads on the menu Thai Me Up, The Bob Marley, Hula Kale and Caesar Salad but the Hula Kale was our favorite. The Shiva Bowl was outstanding and the Curried Cauliflower soup was bursting with flavor. We had breakfast at Joi one morning and were blown away by the Superfood Pancakes, the Savory Breakfast Bowl and Joi's House-Made Granola. Thanks Joi I will be trying to recreate many of these dishes at home. Veggie Grill in several locations was also a repeat or to be honest a threepeat. 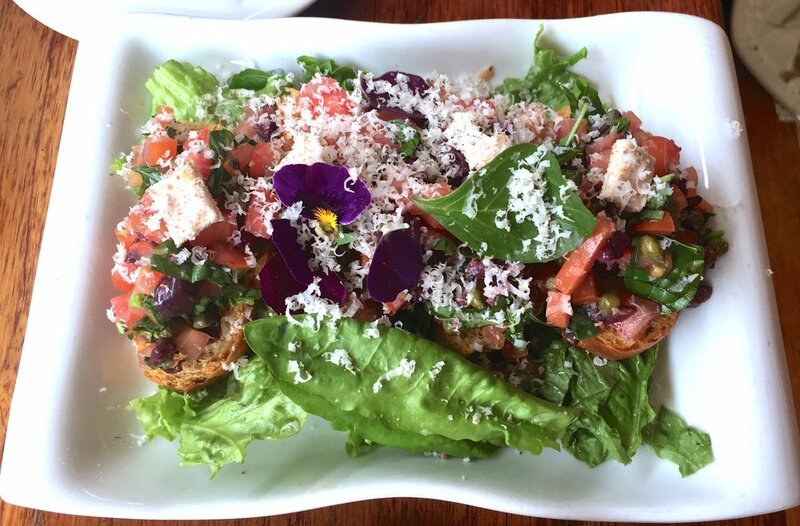 The Quinoa Power Salad topped with a portobello mushroom was what beaconed us over and over. I know there are countless other options on the menu but truthfully I never made it past this dish on all three visits. I named it the Quinoa Power Portobello Salad and could not get over how juicy and tasty they were able to get the mushroom. A very satisfying salad indeed. We had a lovely dinner at Little Pine, a 100% organic vegan bistro in Sliver Lake, L.A. that was recently opened by Moby. 100% of profits from the restaurant are donated to animal welfare organizations. We started with Panzanella and Brussels Sprouts but the star of our meal was the Mushroom Bourguignon. The depth of flavor was so delicious that we were very tempted to lick the plate. I am sure Julia Childs would have approved of this dish. We finished off the meal with S'mores Ganache which was a great little treat to share, beautifully presented oh so decadent. Mesa Verde in Santa Barbara has a unique presentation of a very creative selection of Mediterranean plates. We had a fun dinner on the patio and were impressed with the flavors the colors and the freshness. The second week of my trip I was joined by my daughter, we drove up the coast to San Francisco starting in San Diego. I decided to make this week a 95% raw week so we had a great start to our day at the cafe at Trilogy Sanctuary, a rooftop yoga studio in La Jolla. We shared a beautiful Superfood Acai Bowl and the Green Goddess Raw Chopped Salad with the most delicious smokey tomato dressing. We sat outside after our meal and sipped tea while watching an aerial yoga class. After a day of exploring had a very late lunch at a raw vegan restaurant called Peace Pies and we loved their menu. We started with Chips n' Guac and then shared the Karmic Kale Salad and the Magical Mango Curry Wrap. This is raw food at its best. We enjoyed the meal so much that we made a point of having lunch the next day at their other location in Encinitas on our drive up the coast. We were happy we did and really enjoyed the Peaceful Pizza and Mystical Mushroom Quesadilla. There was no room for dessert but it looked like they had a great selection. We ended up having delicious raw picnics along the roadside with stunning vistas as we made our way up the coast and popped into a few more juice bars and restaurants along the way. Lunch at Green Table in Santa Barbara was a treat. 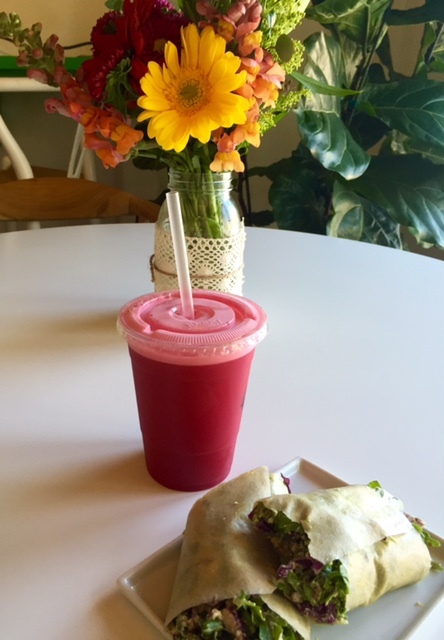 I chose the Raw Vegan Wrap without cheese and the Fresh Start juice blend which I highly recommend. Vitality Bowls in Palo Alto was a great find for big beautiful bowls of goodness on a warm day. A favorite here was the The Green Bowl but we substituted the granola with mulberries to keep it raw. So you think Texas is only home to big beef barbecue? Spoiler alert: I did a quick visit to Austin and San Antonio and found vegan options on virtually every corner. Austin is decidedly the more hip and edgy of the two cities and I definitely felt under-pieced and under-tattooed. Austin offers endless food truck options along with sit down restaurants and of course, the original Whole Foods Market. It's worth making the trek just to see this A-mazing store! After lunch we enjoyed a leisurely ten mile bike ride in the warm sunshine and followed it up with wheat grass shots and smoothies at Juiceland (Barton Springs Road location). We loved this super fun and funky chain of juice bars throughout Austin. Sunday brunch at Mother's Cafe was a treat. They have plenty of vegan options from pancakes to breakfast tacos. I enjoyed the Huevos a la Mexicana made with tofu instead of eggs, with a few dashes of hot sauce. It was a delicious start to the day. We followed brunch with a cubano coffee chocolate cookie ice cream sandwich at an all vegan ice-cream parlor, Sweet Ritual. Imagine two soft, rich chocolate cookies from Capital City Bakery holding a cold creamy layer of Sweet Ritual's cinnamon cubano coffee -- totally vegan ice-cream. Heaven! Dinner was at Arlo's because we had to try the famous Bac'n Cheeze Burger and it did not disappoint. The seitan bac'n could easily fool omnivores. On our way out of Austin we stopped by Bouldin Creek Cafe and we were so glad we did. The place was packed for Monday lunch so we knew we were going to get a good meal. We had the Garbanzo Tortilla Soup to start and then the Muscle Man Curry and Bouldin Buddha Bowl. The food was fresh and delicious and the people watching was very cool. Reluctantly we rolled out of town but we know we will be back; there were just so many places we did not get to visit. San Antonio feels older and was packed with tourists -- the old-fashioned kind. The vegan options were fewer but we were very happy with the choices. I walked up to Revolucion Coffee & Juice and revived myself with their cold pressed Nourish juice (pineapple+apple+chia). This is not only a coffee and juice shop but it is also a modern running store with a very cool vibe. On to lunch at the friendly Senor Veggie along with a happy lunch crowd. There were so many options but I settled on a Grilled Veggie Pita sandwich with a spicy poblano cashew crema along with a side of the vegetable of the day (cilantro, lime roasted carrots). It was easy to see why Senor Veggie is a favorite among the locals and not just the vegan crowd. I then set off in search of vegan ice-cream and after a 5 mile hike via the famous River Walk, I arrived in the Pearl shopping district and headed straight to Lick Honest Ice-Creams. I rewarded myself with two scoops (golfball size) one coconut strawberry basil and one chocolate, coconut & peanut butter. This gave me the delicious energy burst I needed the head back down the river. I joined my husband and several colleagues for dinner at Bliss a high end chef owned restaurant in the Southtown district. This was a fine dining experience and I am happy to say that they went out of their way to create a vegan dish of grilled seasonal vegetables served with delicious lentils. There were a couple of vegetarians in our party and they loved the Asparagus Soup followed by the Vegetarian Enchilada. On our last day in town we headed back up to the Pearl district and had lunch at Green Vegetarian Cusine. I had the portobello steak with caramelized onions and mashed potatoes and kale salad and my husband had the protein salad packed with greens and topped with falafel. The food was delicious and very satisfying but we did leave room for a scoop of ice-cream at Lick since it was just across the street. Luck us. We headed to the airport later that day and once we got through security we realized that we should have ordered some take-out from Green Vegetarian Cusine. But we did have fun making do with the slim pickings at the airport and ended up with a delicious dish -- pieced together from a couple of places. Green salad topped with rice, black beans and guacamole with an apple for desert hit the spot. Being on the road and exploring new cities and flavors is always fun but I am happy to be back in my own kitchen preparing my favorite food, Big Beautiful Salads, sweet potatoes and steamed greens. Nutritious Food: A Silver Bullet in the Battle Against Cancer? Wondering what role nutrition can play in reducing your risk of cancer, or helping those who are battling the disease get a leg up on returning to full health? That’s why I recently attended a two-day workshop at The Smith Center for Healing and the Arts: Culinary Translation in Cancer Care. The classes offered instruction in delicious, whole-foods recipe preparation and research-based nutrition information, all delivered by trained nutrition counselors and chefs. While the group stressed that the science of what we know about the intersection of food and cancer is still evolving, there are indeed areas where the data is consistent. Some cancers are clearly related to nutrition and some diets increase our risk of getting cancer. Even more compelling, the science is very clear that we all need to increase our consumption of a whole food plant-based food. So, takeaway number one is EAT MORE FRESH FRUITS, VEGETABLES, NUTS and SEEDS! What’s more, the food also needs to be nourishing as well as nutrient rich in order to help with healing. 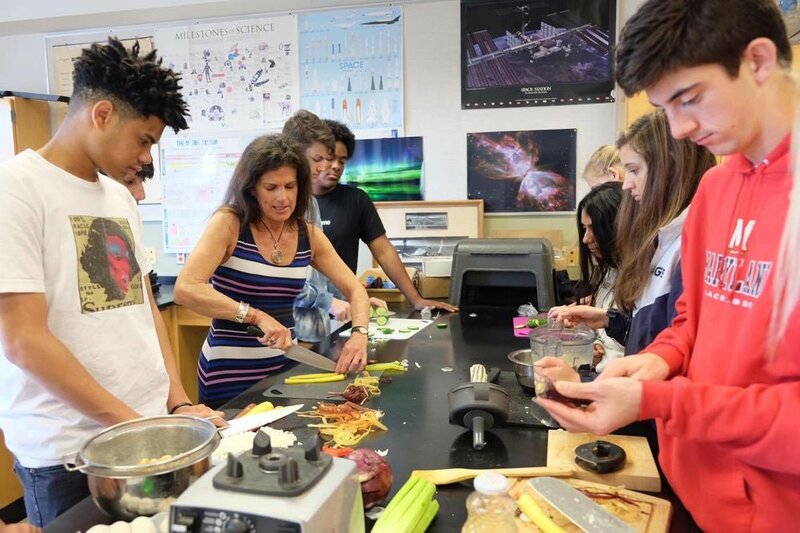 Healthy food can be delicious and two of the seminar leaders, Chef Laura and Chef Ruth, shared many delicious, nutritious recipes that can be put together fast. Hey that’s my kind of thing. As Chef Laura Pole stated: "Simply giving a person a list of foods that they must eat is only part of the equation. She went on to say, "If you keep in mind that only 25% of Americans even know how to cook these days, we really have to help them translate the prescription to the plate." She also emphasized that food needs to be "enjoyable and pleasurable, delicious, and a coming together of community in order to heal." Karen Collins, Nutrition Advisor to the American Institute of Cancer Research made the point that "the evidence is good that we really should be paying attention to the way we take care of ourselves because it does make a difference in your cancer risk, your risk of getting cancer and your survival after cancer.” She emphasized that there may be “many paths to that diet when you focus on eating more of a variety of healthful plant foods that all have positive things to contribute to your health and to make that the focus of your eating." The Speedy Vegan is all about "Nutritious, Delicious, Fresh and Fast" so if you want to learn how to incorporate more fruits and vegetables into you life, we’re here to show you how. Do you ever have days like that? You scroll through your Facebook feed and see photo what people are eating and then read about all their ailments?